As TEMPUR-Pedic revises its memory foam mattress portfolio. 2018 has been the Year of the Makeover for TEMPUR-Pedic. This is more than adding a new model or collection while dropping another, more than new versions of existing models. In recent years, the original memory foam mattress company has added TEMPUR-foam/air support hybrids (TEMPUR-Choice Collection), then added TEMPUR-foam/pocket coil hybrids (TEMPUR-Flex Collection), then phased out the air support. Now the changes are large-scale, a remaking of most of their memory foam mattress portfolio. 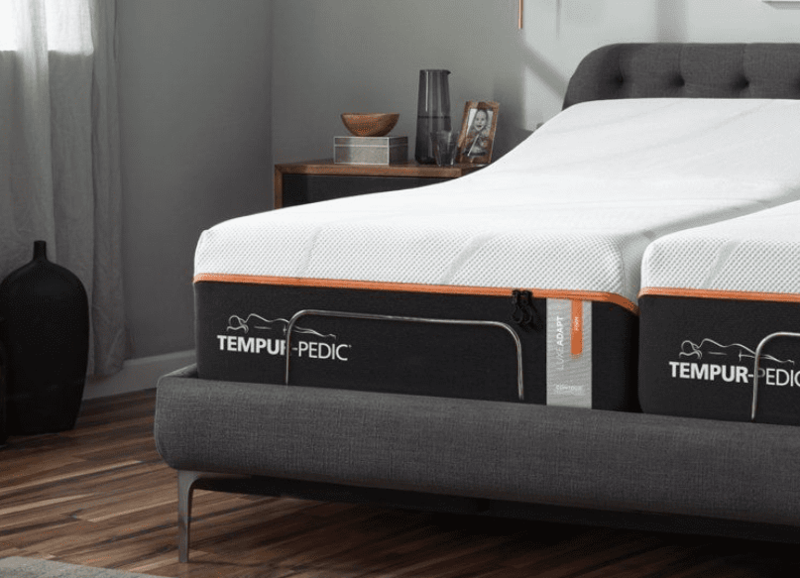 In January, at the Las Vegas Winter Market, TEMPUR-Pedic introduced two new series, TEMPUR-Adapt and TEMPUR-ProAdapt, discontinuing the two Prima and three Supreme (but not Supreme Breeze) models from three collections. In July, at the Summer Market, the company introduced the two-model TEMPUR-LuxeAdapt series. Early 2019 (probably at the Winter Market), they will introduce an updated Breeze series (BreezeAdapt?). TEMPUR-LuxeAdapt is the third new series, introduced to retailers by TEMPUR-Pedic in July 2018, but not listed on their website until November. At the end of the month, it was not yet on Amazon, but it is now. By order of listing, TEMPUR-Adapt was first, followed shortly by TEMPUR-ProAdapt. Expect the fourth series to be listed by Spring 2019. At approximately 13”, TEMPUR-LuxeAdapt models are among the highest TEMPUR-Pedic mattresses. This is ½” under the 13½” height of the current Luxe models and ½” over the Elite models. The two LuxeAdapt models are simply called Soft and Firm. The TEMPUR-LuxeAdapt Soft replaces the TEMPUR-Cloud Elite and TEMPUR-Cloud Luxe, and TEMPUR-LuxeAdapt Firm replaces TEMPUR-Contour Elite and TEMPUR-Contour Luxe. Industry news accounts left the door open for a future TEMPUR-LuxeAdapt Hybrid, which would replace the TEMPUR-Flex Elite, but that is not certain at this time. The construction of the LuxeAdapt mattresses corresponds to the earlier Luxe models. Both sets have dual covers and four layers of foam. In each set, the difference between one model and the other is the composition of the Comfort Layer. This is TEMPUR-Pedic’s SmartClimate® Dual Cover System, which was standard in 2017 models. This has a zip-off washable top cover and a stretch-knit inner cover. The inner cover has moisture-wicking fibers for coolness and dryness. Both covers are breathable for freshness and cooling airflow. This is where the distinction is made between the two LuxeAdapt mattresses. 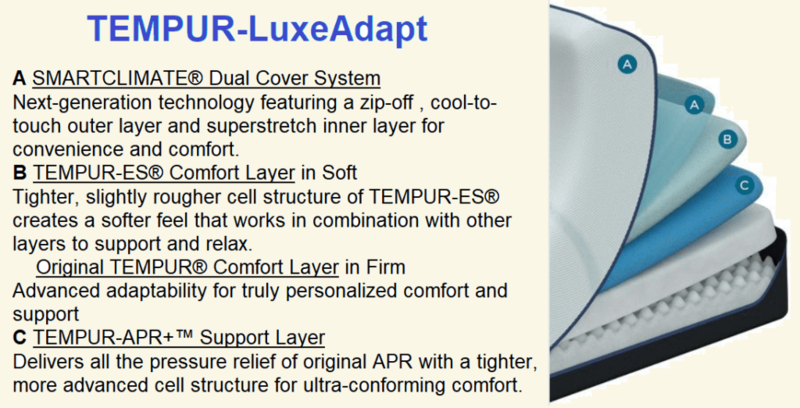 Firm – In this layer, the LuxeAdapt Firm differs from the TEMPUR-Contour™ Rhapsody Luxe and TEMPUR-Contour® Elite. While the Comfort Layer of the Contour models is TEMPUR-HD, in LuxeAdapt Firm it is the original TEMPUR Material (TEMPUR-Pedic’s name for their memory foam). Therefore, the top foam in the Firm is slightly less firm and less conforming (but cooler and quicker responding) than in the Contour mattresses. But this is likely compensated by the Support Layer underneath. Like the bases in the TEMPUR-Cloud and TEMPUR-Contour models, the TEMPUR-LuxeAdapt base is two layers of 1.8 lbs/in³ HD polyurethane foam. Unlike them, the bottom layer is convoluted on the top surface (see the diagram). This could be to provide horizontal airflow for cooling, but that is questionable unless the upper foam were ventilated since hardly any air can filter through the extra dense foam. However, this may be to add some flexibility or bounce to the feel. Mattresses in the TEMPUR-LuxeAdapt Series are covered by TEMPUR-Pedic’s standard 10-year Warranty. Returns may be made during the 90-Night Trial. This is much less than Selectabed’s 30-year Warranty and 120-Day Sleep Guarantee on their Tri-Pedic Series. The prospects look good for the new TEMPUR-LuxeAdapt Series, if we judge by the reception to the TEMPUR-Adapt Series and TEMPUR-ProAdapt Series. LuxeAdapt is replacing both Luxe and Elite models in the TEMPUR-Cloud and TEMPUR-Contour collections. For now the replacements do not include one for the TEMPUR-Flex Elite. At the time of this writing, since this series is so new, there are no customer reviews. After several months there should be enough to determine average customer ratings for TEMPUR-LuxeAdapt mattresses.